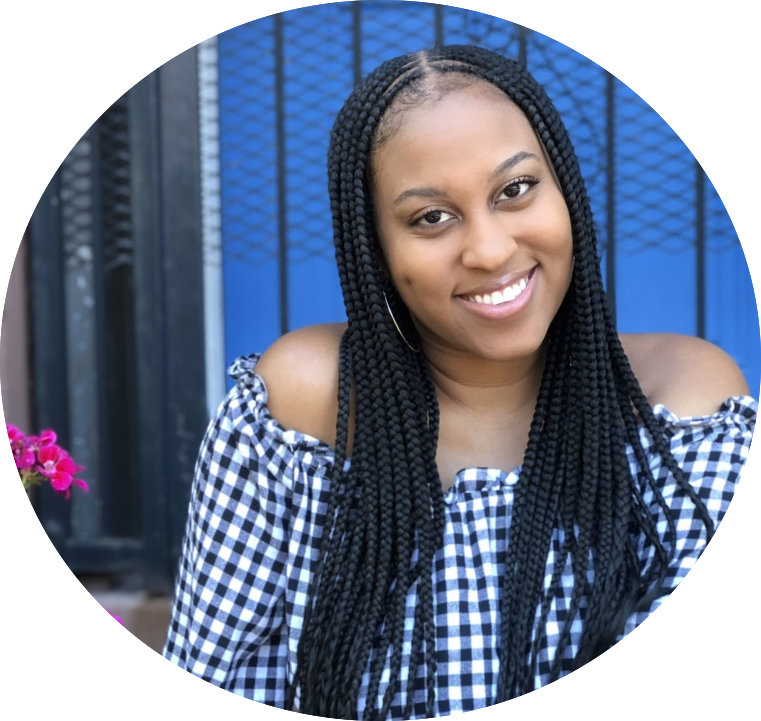 Glossier recently launched its makeup brand, Glossier Play and the brand kindly gifted me a few products to try out. 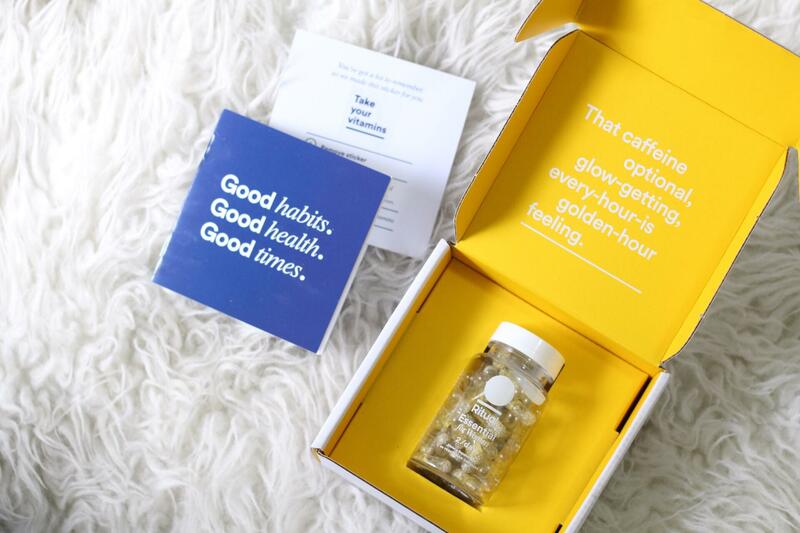 Now, as with all new launches from Glossier, this was highly anticipated on social media. They started teasing the brand in March with a new Instagram account and distorted visuals to get us hype for whatever was coming. Many guessed that it was makeup and they were right. 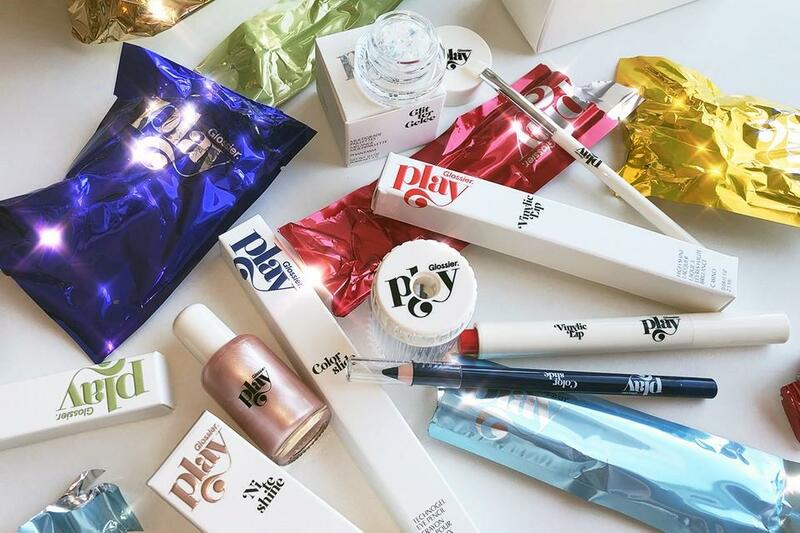 Glossier Play is a brand of dialed-up beauty extras. We believe the best part about going out is getting ready. 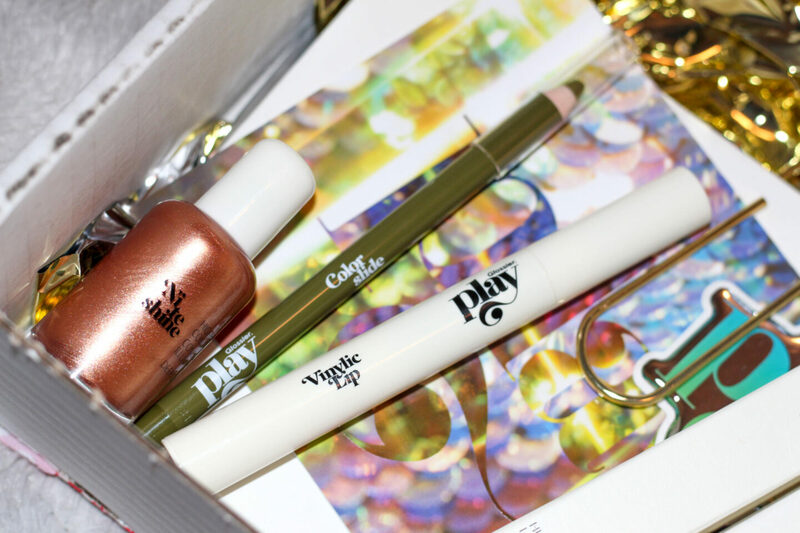 In my package I received the Color Slide pencil, Lip Vinylic, and Nite Shine highlighter. 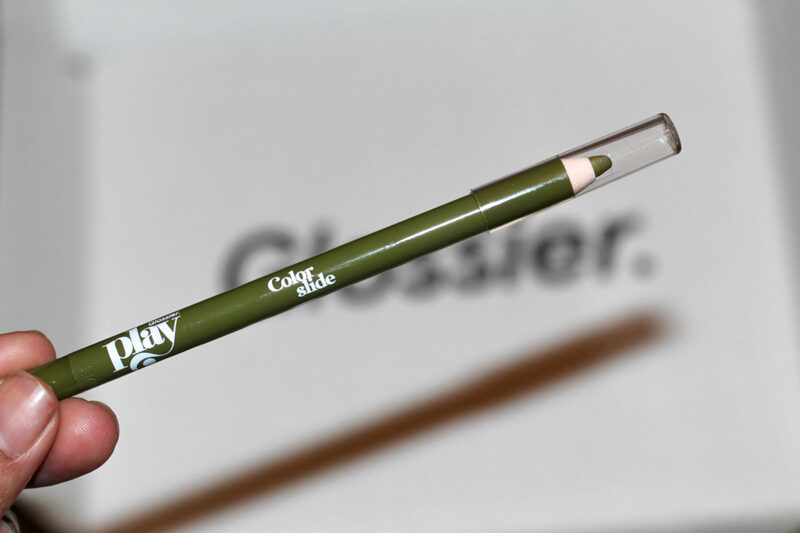 I received the Color Slide in Stable Relationship which is described as a “moss green.” These waterproof pencils are available in 14 shades and claim to last for 12 hrs (8 hrs on the waterline). I LOVE that Stable Relationship is a wearable green. I normally don’t wear too much color on my eyes but this is muted enough to be worn on a daily. The formula is so smooth that this just glides across the skin. 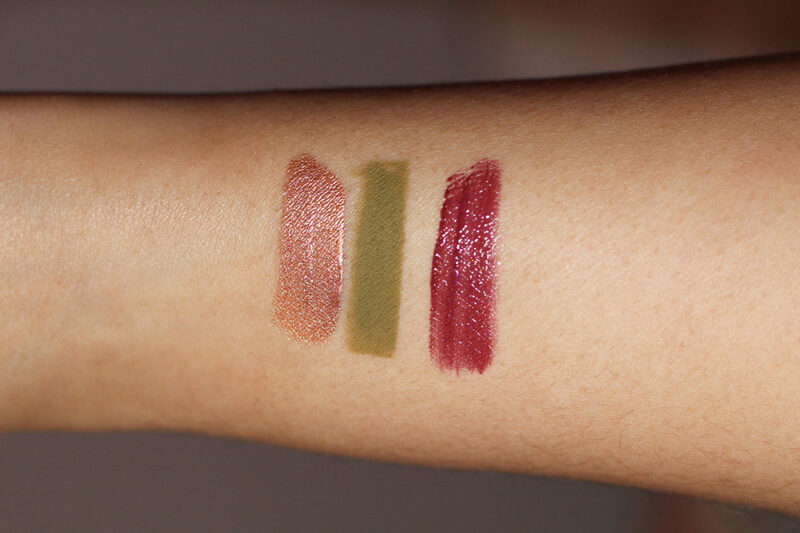 Second, I received their Vinylic Lip in Bank, which is described as a “rich plum.” This shade is right up my alley and I love the way it looks on my skin (swatched below). These currently are available in 6 shades and features a felt tip applicator that applies a beautiful wash of color. You have to click the bottom of the pencil to dispense the color. I found that the pigment kept coming even after I stopped clicking, so be mindful of that. The high-shine formula feels really good on the lips. 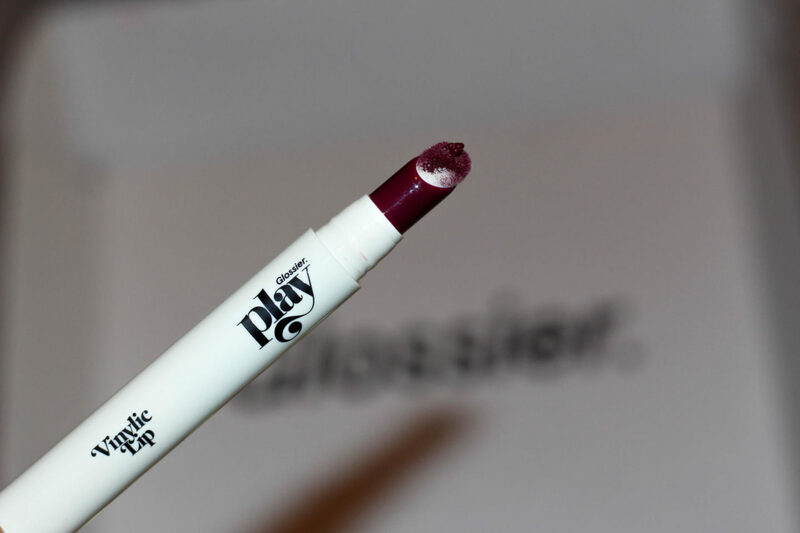 Since these are lip lacquers, the product doesn’t stay on for long but this shade did leave behind a really pretty stain. 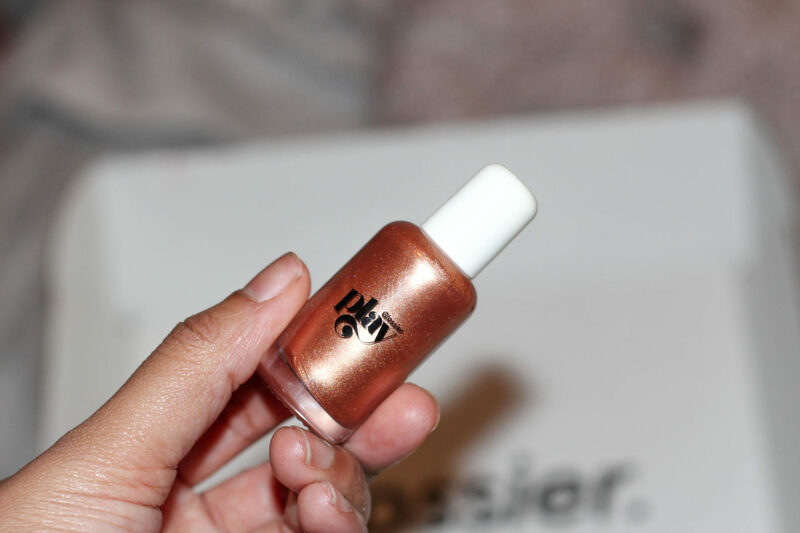 Last but certainly not least, I received the Niteshine highlighter in Deep Copper. I was so excited about this product when I first saw it on the site and let me tell you, it did not disappoint. This liquid copper in a bottle is a product that I had only dreamed of before Glossier Play made my dreams come true. These come in 4 different shades and features a doe-foot applicator for maximum precision. It’s packaged in a small bottle that looks more like a nail polish but don’t let the size of the product fool you. You only need a small amount of the liquid to get a good amount of glow. Out of all of the products I received, this is the one I’ve been grabbing daily. I dot the high points of my cheeks with 3 small specs and blend them out for the most gorgeous glow. If you’re going to try anything from Glossier Play, I’d recommend the Niteshine. One thing I want to call out is the packaging of the products. Glossier’s skincare brand is known for its minimalistic approach to beauty, so it was surprising to see the excess packaging of Glossier Play. In addition to the normal carton, each product was also packed in a colored foil inside of the box. It seems like this was more for the aesthetic than function but I found it unnecessary. Other than the excessive packaging, Glossier Play is a winner in my book and I can’t wait to see what they come out with next. Never miss a post again! Sign up for the newsletter.